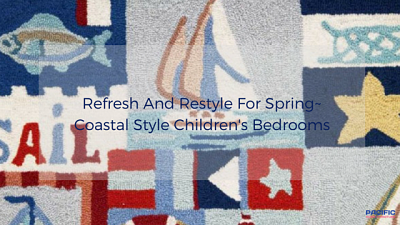 Refresh and Restyle for Spring and what better way then to decorate your child's bedroom! Pacific Home Furniture has put together a nautical room for your little guy and a seaside mermaid room for your precious princess! All that's left is your loving touches and your little one will have the bedroom of their dreams! 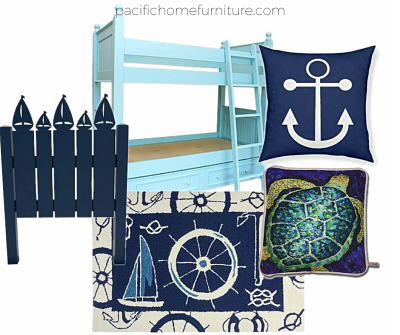 Nautical Moodboard for a boy's room to take them from toddler through elementary school. 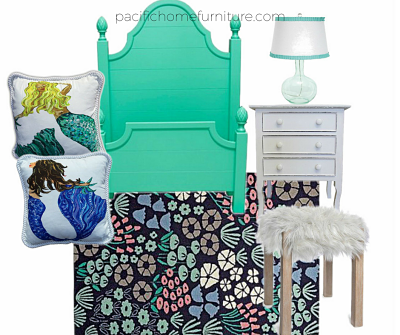 Seaside Mermaid Moodboard for a girl's room design includes a Cap Cod bed with headboard and footboard. CAPE COD Bed comes complete with headboard, footboard, slates & rails. Plus, your choice of color finishes. HOPPIN' JOHN Bunbkbeds are perfect for children's rooms, coastal and beach house living to double your space. COASTAL BOATS & NAUTICAL OARS Decor to decorate in your little ones room. COTTAGE FURNITURE Cottage Nightstand is beautifully crafted from solid wood. RUGS The finishing piece to pull the room together. PILLOWS Make the bed and room so cozy. LAMPS Children's Lighting can be found at our sister site, PacificHomeLighting.com. Thank you for taking the time to read and visit our Coastal Blog! We are always happy to help or answer any of your questions! Reach us with your thoughts or comments at the bottom of this blog post or here, contactus@pacifichomefurniture.com.